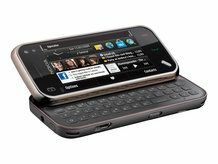 Vodafone is now offering the Nokia N97 mini for pre-order, ahead of its launch later this month. Earlier we brought you coverage of Orange's accidental offering of the same phone before Nokia authorised it for sale - none of the phones were dispatched and Orange admitted it had made a mistake. But now it seems we have a real date for the new phone's release - 29 October according to the Vodafone pre-order page. As we told you in our in-depth hands on last month, the N97 mini apes nearly all the features of its bigger brother, but dispenses with the d-pad and reduces the screen size, as well as dropping some of the camera hardware too. It also halves the internal memory to 16GB, so if you're looking to fill it to the brim with movies and music you may want to add in a microSD card. The phone will be free on all plans for Vodafone, but will cost at least £40 per month if you want it on an 18-month deal. It's supposed to be the lower-cost option to the N97, but both are available on the same deals from Vodafone. Over at Nokia's online store, the N97 mini costs £429 with the larger N97 coming in at £449, so there's not a lot of difference in cost between the two.